1. According to a 2009 study, children who spend more time in the playground behave better than those who do not. 2. According to a research published in the Early Childhood Education Journal in 2007, both free play and adult- guided play teaches a child to be more aware of other people’s feelings. It also helps regulate their own emotions. 3. Playing makes a child active and an active child grows into an active adult, thus reducing the risk of heart diseases and other ailments emerging from a sedentary lifestyle. 4. Games have a great impact on sensory perception at a number of different levels. It also contributes a lot to social development. 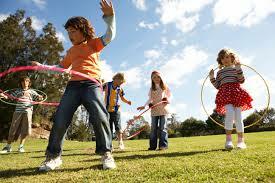 Games help children develop both fine and gross motor skills. 5. Physical activity boosts physical development. Different plays help promote different skills. For instance, skipping takes balance, sports activity involves coordination, climbing monkey bars build strength. The dexterity your child develops over play carries on to his/ her everyday life. 6. Play also help children work through stress and crankiness. In fact, lack of adequate play can make your child grumpy and tense. 7. Last, bot not the least, games promote family fun and togetherness. Children love it and reciprocate when parents interact with them and play with them. Give your child the liberty to decide what to play and how to play, but within the limits of safety. This helps to build up his power of judgment and you get an idea of what delights him the most. Join your child’s play but only when you are invited. The attention you show to your child during playtime in important in building his self esteem. Marbles: Marbles is like a classic game and has been played by children for centuries. It involves playing with polished spheres made of gemstones and rocks. The object of the game is to use o large marble, often called to shooter, to hit other marbles. Board games: There are different types of board games with challenges for different age groups. Some games require skill and strategy while some on the dice to determine where the game goes. Checkers is a classic board game where kids move small colored pieces around a checkered board to collect opponent’s pieces. Nanoblocks: It is a building set game that immensely helps in the child’s development. The block sizes in a nanoblock are generally very small. Some can be hardly held in hand. Each set comes with several extra pieces to be used if some pieces get lost or build some extra small things. PREVIOUS POST Previous post: Painting in Oils – Why Don’t More Women Do It? NEXT POST Next post: How Do You Make a French Bead Flower?